French Canadians from Les Fusiliers Mount-Royal met up with German SS troopers at St. Martin-de-Fontenay on August 1 1944. The Canadians were to clear the SS from a church in the area. I played the Canadians and Robert Zinselmeyer, the SS . This was a 6 turn scenario and the Canadians win immediately when there were no unbroken SS in the church. 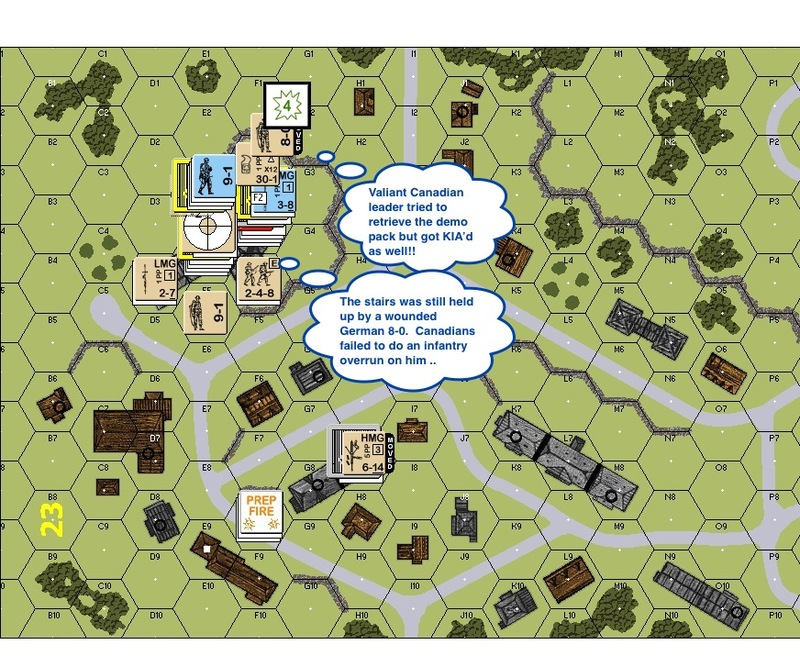 This was the Canadian Turn 1 : the Canadian death star contained a heavy machine gun (“HMG”) that went on a long rate tear, obliterating the east side of the church A team of Canadians rushed forward from the northeast. Another team moved around to the south-west of the church to catch Germans routing to that side. This was the German Turn 2 : the Canadian death star continued to work on the east of the church. Canadians move closer from the northeast and the southwest. 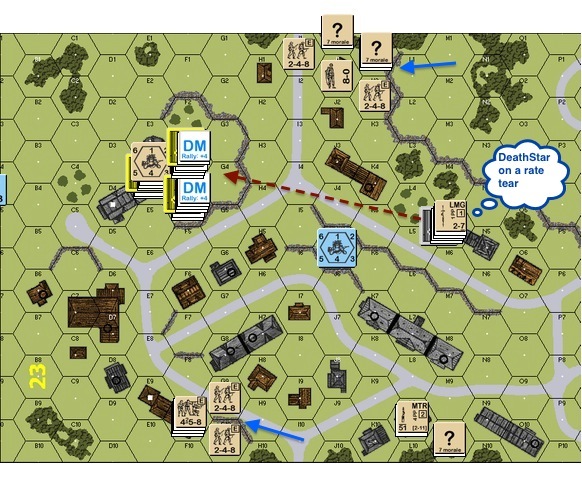 This is the German Turn 3: a half squad attempted to approach the church with a demo pack earlier but was routed. This was the first attempt to retrieve it. The half squad (“HS”) was then KIA’d, as were a number of other Canadian units afterwards. The Canadians never got this demo pack back. The Canadian death star decided to relocate for lack of targets. 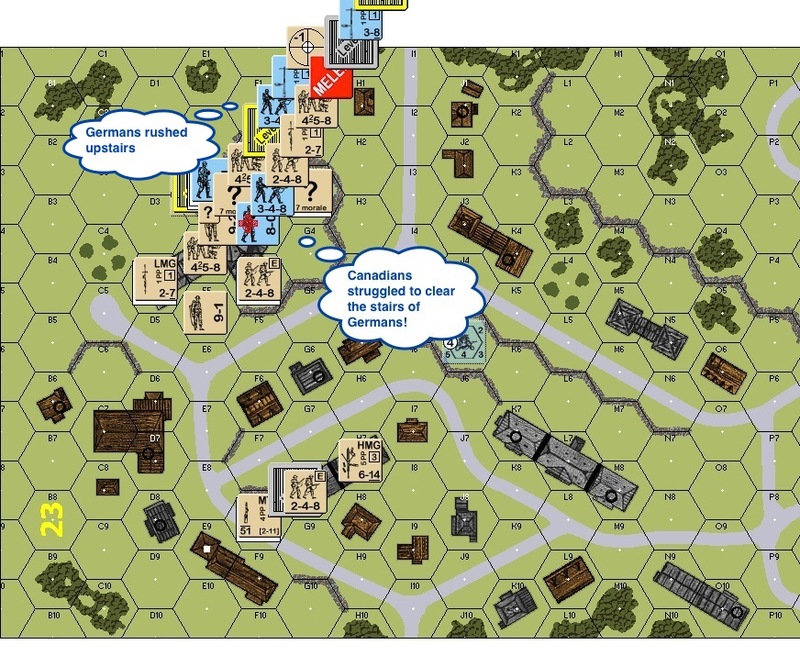 This was the Canadian Turn 4 : The Canadians didn’t do very well on the east side. The lone intruding HS crashed into the church but was immediately met with the SS in close combat! 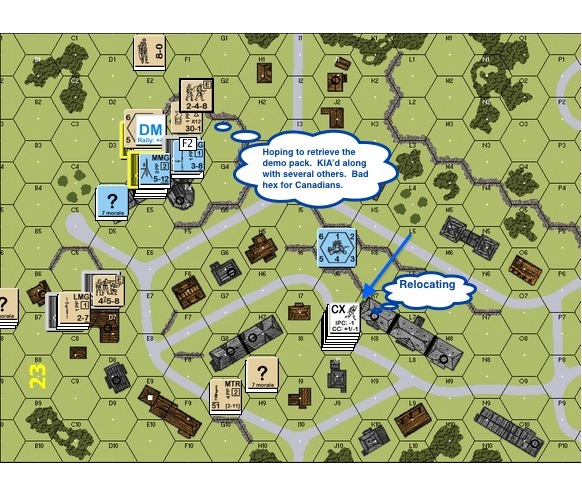 German Turn 5 : Even though the odds of that mêlée was turning because of reinforcing Canadians from all sides. The Germans were still blocking one of the staircases while the rest raced upstairs. Canadian Turn 6 : A valiant Canadian 8-0 made a desperate try for the dropped demo pack and was killed as well. The mêlée hadn’t ended. Scores of Canadians were held up by a wounded German 8-0 at one of the staircases! Someone suggested an infantry overrun on the wounded German but the Canadians failed to act. It was just too crowded and they were afraid that they might shoot their own. The Canadians rushed up the other staircase in frustration. 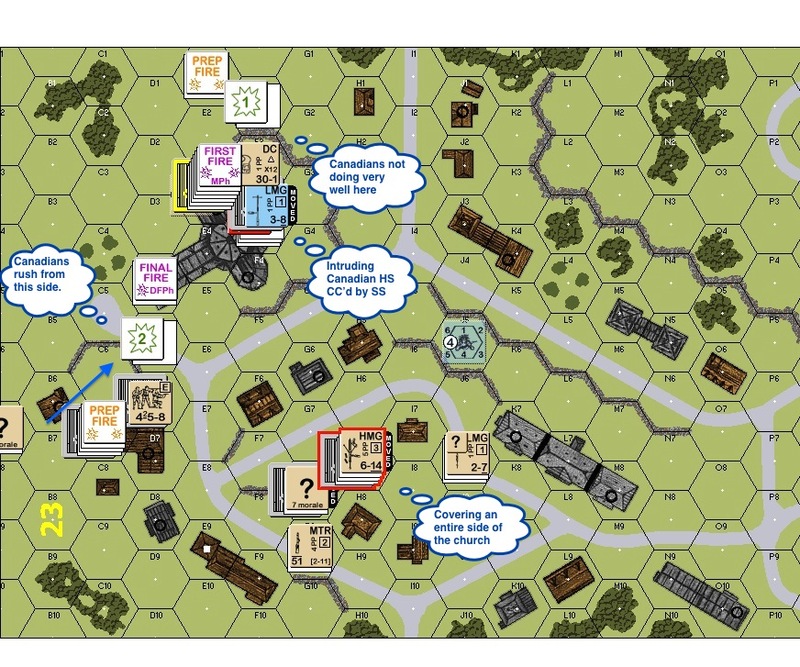 Last German Turn : the Canadians were able to dispatch the wounded German 8-0 at the end of the previous turn. All German upstairs were then immediately encircled!! The Canadian laid heavy firepower on the Germans inside the church. The HMG went on a rate tear as well! However when the smoke settled, one German HS remained. The Canadians ran out of time. 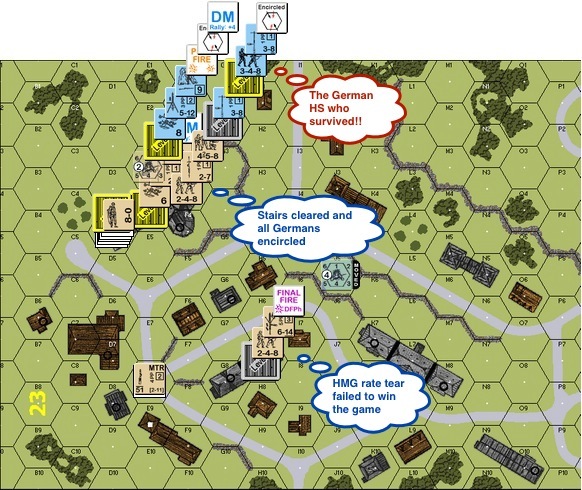 This entry was posted in Game Play and tagged AAR, Advanced Squad Leader, ASL, Board Game, gaming, Hong Kong, Normandy, PBEM, VASL, wargame. Bookmark the permalink. James played this at heroes, I think against Martin Mayers. 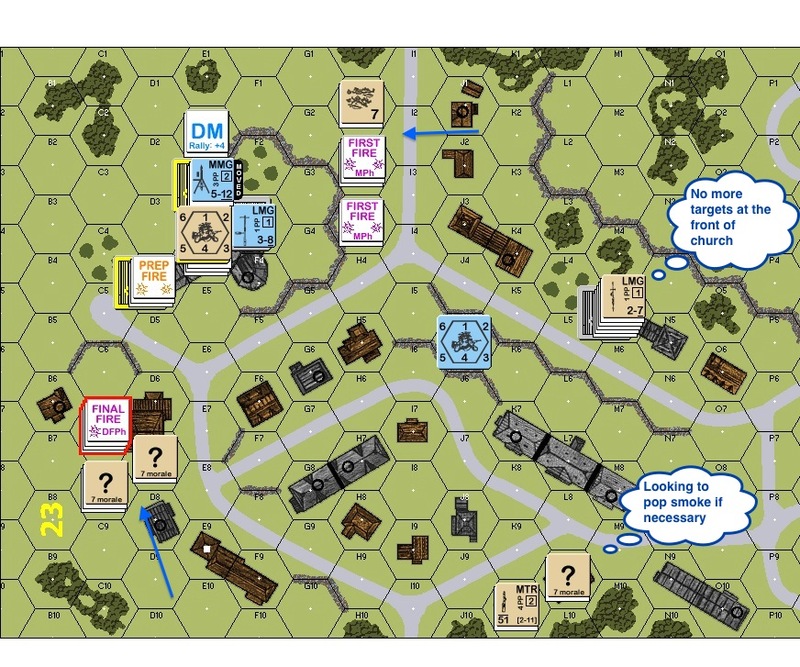 Yeah – the scenario looks simple enough but it isn’t easy getting all the SS to break inside a stone building! Nice, looks close as well. Play the morale card and pretend it was your humanity in refusing to execute all the SS that gives you the ‘real’ win..
Gotta let a few live to sing of the martial might of the French Canadians!! !